Liverpool fencing. 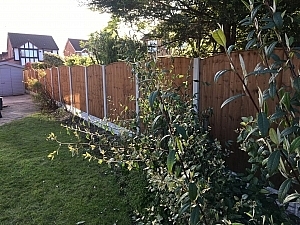 Another professional garden fence fitted by one of Liverpools leading fencing contractors. We guarantee all our work on a customer satisfaction based policy and for this reason we do not except any deposit from you the customer. We don’t take any payment until you are 100% happy with our work. 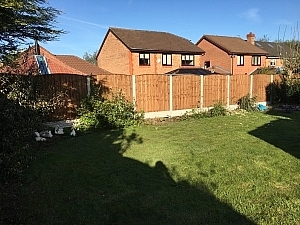 Most Liverpool fencing companies work on a deposit first basis which could be a problem trying to resolve any problems you my have. Trust, reliability, hard work are just three of many we strive for each and every working day. 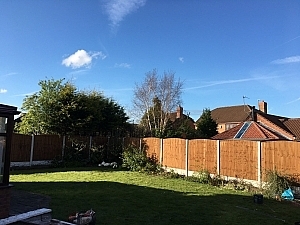 We appreciate ever customer weather it’s just 1 fence panel or 50 we treat everyone with the same respect. With out you the customer we Liverpool one fencing would exists. Now back to our most recent Liverpool fencing project. 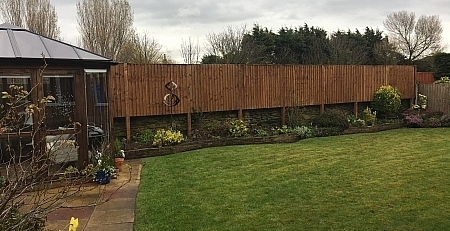 This garden fence consist of concrete and timber. The concrete post used on this project where 7.9 ft set just under 2ft in the ground using a semi wet sand, stone, cement mix. Then we level in 1 6x1ft concrete base panel and top with a 6×5 arched heavy duty feather edge fence panel. This project was Aprox 60 meters in Croxteth park, Liverpool. All our timber products are treated. We manufacture all our concrete and timber products on our 1acer site in Liverpool. Call Liverpool ONE Fencing for all your Liverpool fencing needs. Please do not confuse us with similar sounding named companies our five star reviews speak for them selves.